After a turbulent year, Michelle Sevigny heard it as she ran seaside: do more of this. ​ After researching long-distance coastal routes, she prepared to solo hike the 509-kilometre Lycian Way. The journey doesn’t take her where she planned, but as she camps in the wild, gets lost without water and confronts charging sheepdogs, the path guides her to exactly where she needs to be. 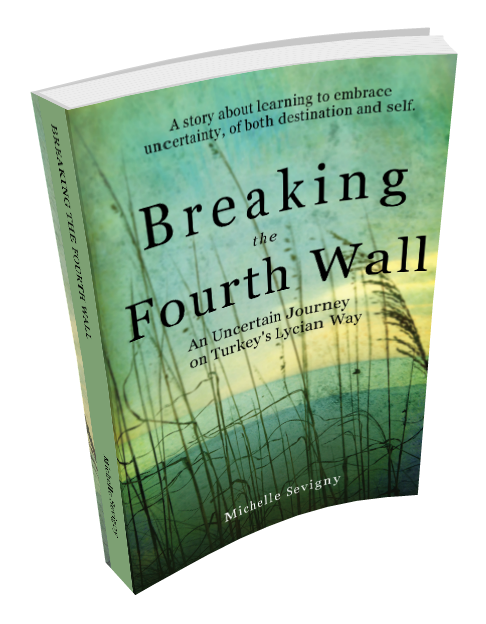 ​ Breaking the Fourth Wall: An Uncertain Journey on Turkey’s Lycian Way is a story about learning to embrace uncertainty, of both destination and self, and discovering an answer to the universal question: who are we? "...witty, engaging prose, laced with beautiful phrasing and imagery, a gem of a story." - Irene A. "....a gift to readers, I nearly missed school pick-up!" ​"Michelle Sevigny has captured her journey in a way you'll want to tell others about. This book is a great gift for any adventurer in your life or for anyone looking for a meaningful escape anytime of the year." - Kipawa H.
​"These emotive vignettes will engage seasoned hikers and wannabe trekkers alike. With elegant prose, sometimes verging on poetic, and Sevigny’s clever, multilingual word play, Breaking the Fourth Wall establishes Sevigny as a serious and dynamic author of travel writing. This isn’t a book just about Turkey, or even just about travel, making Breaking the Fourth Wall a book with universal appeal." "Powerful, witty and raw. I felt I was taken on the journey with her, and in turn, on a journey with myself. A fabulous read." - Robyn A. "I was intrigued right from the start about her experiences with wild camping, interactions with fellow hikers and Michelle's personification of Likya. I thoroughly enjoyed this book." - Ric M.
"You really felt that you were on the journey with her." "I enjoyed learning about the Lycian Way and certain episodes, such as accidentally stumbling upon ancient ruins or the unexpected generosity of the locals, lend genuineness and authenticity to the book. Five stars." "​Michelle Sevigny is frank and honest throughout this exceptionally good memoir as she shares both the very good and pretty awful moods she experiences, and I felt as though I were sharing the healing process that her journey facilitated. Her interactions with the dogs she meets along the way, and her yearning to finally meet the new dog she was destined to have as her companion are poignant moments in the story and will, no doubt, affect anyone who’s ever lost a beloved companion dog as strongly as Sevigny’s story affected me. ​"An amazing story, I've never read a book so quickly." ​"I flew through Breaking the Fourth Wall: An Uncertain Journey on Turkey's Way, and now I'm reading it again, pencil in hand, underlining the author's thoughts and feelings that tug at me." Got the Book and Want to Know More? ​Contact me for an interview. Please see my Media page for graphics, downloadable photos, press releases and suggested interview topics/questions.